It’s all about the People… On the Red Carpet. Tonight was the People’s Choice Awards… and with that comes my red carpet fashion critique. Here we go. 1. Here we have the Once happy couple: Ginnifer Goodwin and Josh Dallas (#Snowing!) I love how their on-screen chemistry transcended to real life. But, back to fashion, their outfits are perfectly tailored and they are dressed to the nines. 2. E! reporter Giuliana Rancic looks gorgeous in a tulle mint gown. #PinterestWorthy. 3. Disney starlet Bella Thorne… actually looks good. But, maybe a little too mature? The pantsuit is well-tailored. But, she’s 16 not 30. And it looks she’s had a little something done to her face. But, her stylist deserves so much praise for that tailoring job: love. 4. Country superstar Hunter Hayes looks dapper in a black-on-black suit. And my fingers are crossed for him at the Grammys next month! 5. “Modern Family” star Sarah Hyland: she looks gorgeous and looks very happy. However, I’m not a fan of that overlay. Get rid of that, and it’s a 10. 6. Kelly McCreary aka Dr. Maggie Pierce on “Greys Anatomy” looks fun and cute. The new cardio doctor at Grey Sloan Memorial Hospital and Meredith’s latest sister’s dress is making me envious! Love love love it. It’s fun and edgy, but so chic at the same time. 7. 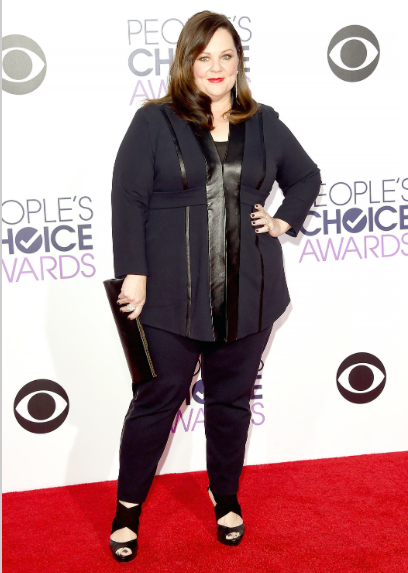 Melissa McCarthy: it slims her down and she looks so glamorous. And that’s what I think she rocks the best. 8. And finally, we have Bellamy Young who plays Mellie on another Shonda hit, “Scandal.” Her dress is edgy and she rocks it, but, it looks a little matronly with her hair. She’s gorgeous and knows how to dress, but this is aging her prematurely. Alright, those are my favorite looks from the PCA’s. How about you? « Guess who’s coming to the States? And brought her fashionable closet with her?